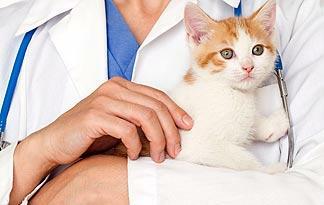 Anyone who has had the "pleasure" of taking a cat for a vet visit knows that it's no picnic. It usually begins with a wrestling match to get the cat into a carrier. If you manage to survive with only a few scratches, consider yourself lucky. Then comes the "drive of doom," where he will demonstrate his well-developed hissing and howling talents, followed by an excruciatingly long wait in the clinic's lobby, where your cat will either retreat into the fetal position in the corner of his carrier or pace wildly within it, meowing at you in what sounds a lot like the feline version of profanity. It's no wonder that a recent survey revealed that two-thirds of cat parents take their pets to the vet less then once a year, in part because of "feline resistance" to the experience. It seems that cats have declared war on veterinary care. Unfortunately, it's a war they're winning handily. You may be one of the precious few humans whose cat is as cool as a cucumber at the vet. If so, read no further. If not, there are things you can do to help your pet relax during trips to the vet and get the most out of his medical exam. Feline healthcare may never be a walk in the park, but you can make it more manageable with our five tips for making vet visits less stressful for your cat.